A brush with India has always been very stimulating for many a wandering soul, especially souls with a creative bent of mind. For years, travelers, writers, photographers, artists and the spiritually inclined have been drawn to this land that is a living laboratory of the most varied cultures and traditions, landscapes and streetscapes, the many tribes and their ways of life, for its unique visual imagery and untold stories. It is not surprising then that Jaipur based architect and designer duo Geetanjali and Ayush, of Anantaya Décor, have created an exquisite range of Lifestyle products and accessories, where each product delicately tells a unique tale carefully dug out from some corner of India. One such story is that of the Rohida wood. 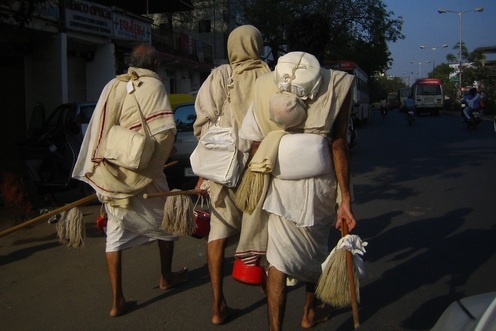 For centuries, traveling Jain monks have been carrying food and water in Rohida wood bowls because they are sturdy, lightweight and inherently hygienic (termite proof). Known as Bhikshapatras in Sanskrit, these bowls were traditionally carried from door to door to collect alms. Fast forward to the days of Superbowl chips & guac and popcorn and movie night at home, and the Rohida food-safe bowl finds a new avatar. Derived from the self propagating Tecomella Undulata tree, Rohida wood is dense grained, sturdy, yet light weight, and has medicinal properties known to heal syphilis, urinary disorders and liver diseases. The wood also happens to be extremely malleable. Far and few between are the craftsmen who possess the skill and precision to transform this wood into extremely thin walled vessels. The outcome is a bowl as light as a feather but one that can be used to safely store food and will not be damaged if exposed to water. Anantaya re-interprets this thousand year old invention and creates a range of well crafted Rohida wood based products that are classically traditional in function but stylishly modern in design. Apart from the Rohida wood, Anantaya draws inspiration from the age old quilt-craft of Rajasthan, classic Blue pottery, the word ‘patrika’ from the hindi language, the ‘jaali’ borrowed from the architecture of western India etc, to create products that are innovative in not just design but also function. Most of these come with quirky names too! Posted in Art, Crafts, History, Rajasthan, Uncategorized, Wondrous India. Bookmark the permalink.